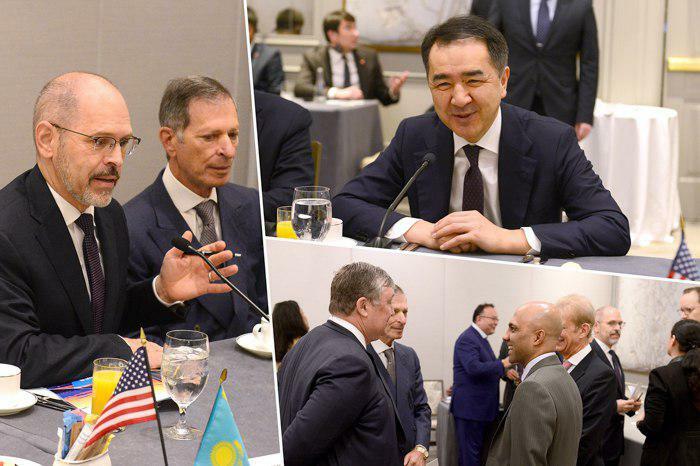 ASTANA­­ – Kazakh Prime Minister Bakhytzhan Sagintayev discussed opportunities for cooperation within Kazakhstan’s third stage modernisation with leading American innovation companies during an April 11-14 visit to the United States. During visits to New York and San Francisco, Sagintayev promoted cooperation in IT technologies, engineering, energy, mining, chemical, food and processing, telecommunications, transport, construction and education. In San Francisco, Sagintayev witnessed the signing of an agreement between Kazakh National Infocommunication Holding Zerde, Almaty’s Autonomous Cluster Fund “Park of Innovative Technologies” (ACF PIT) and Global Venture Alliance (GVA) to open an innovation office in Silicon Valley. The office will facilitate information exchange between Kazakhstan and Silicon Valley, help develop Kazakh start-ups in the region and access the latest innovations and companies to develop business and attract investment in Kazakhstan. 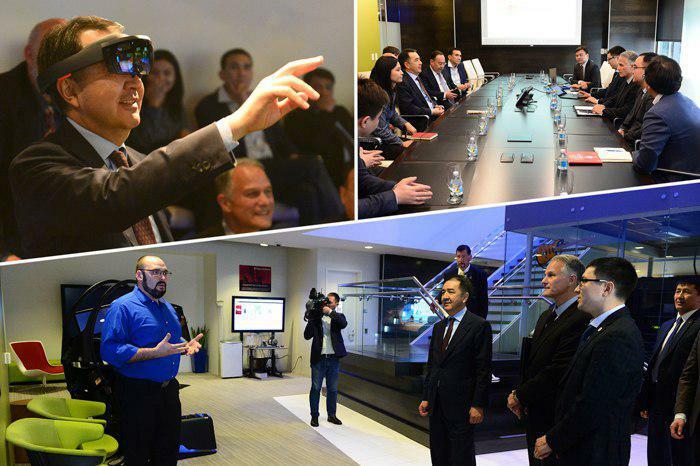 Also in San Francisco, the prime minister participated in the Project: Collider technology forum, where he urged innovation companies to participate in Kazakhstan’s economic modernisation. Sagintayev also met during his trip to the United States with representatives of the United States’ largest financial institutions, including Citigroup, MasterCard, Berkley, Morgan Stanley, Black Rock, Goldman Sachs, rating agencies Standard&Poor’s (S&P), Moody’s and Fitch Group, as well as Greylock Capital Management, American International Group (AIG), Guggenheim International, Alliance Bernstein, Public Capital Advisors and the Business Council of International Understanding (BCIU). The participants discussed the global economy, economic policy in Kazakhstan and opportunities to implement joint projects, attract investments, finance infrastructure projects and manage assets. He also met with representatives of leading companies in artificial intelligence, education, financial and mobile technologies, emphasising that Kazakhstan needs to work with advanced companies and global venture funds to modernise its economy. 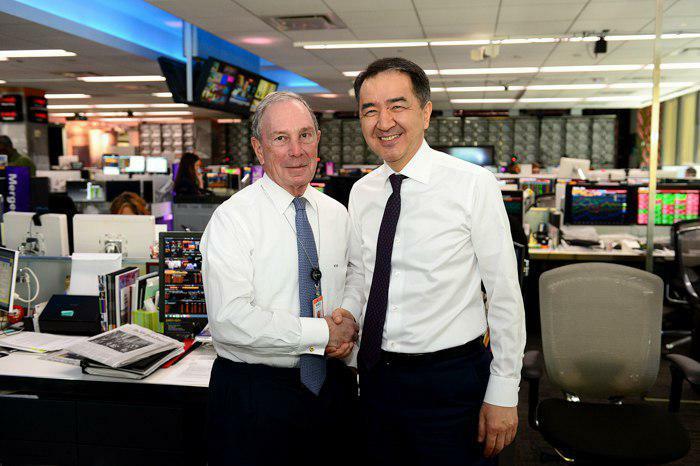 Sagintayev also discussed cooperation in the development of telecommunications infrastructure and the Astana International Financial Centre (AIFC) with former New York mayors Rudolph Giuliani and Michael Bloomberg. Following the meeting with Bloomberg, the parties also signed an agreement to open a Bloomberg office and TV channel in Astana. Sagintayev also discussed efforts to attract new investments and technologies to Kazakhstan with leading U.S. companies, such as I Scuared Capital, General Electric, Grace, Robotti & Company Advisors, AGCO, AES, Black and Veatch and American Industrial Acquisition Corporation. The prime minister also witnessed the signing of an agreement for launching organic food production with worldwide distributor of fruits Rahal Foods. Agreements on attracting investments into the production of technological equipment in Kazakhstan were reached during meeting with OSI Systems, Pfizer and GE Transportation. Kazakh representatives also signed a memorandum of understanding between Zerde and Cisco to finance pilot projects on self-service kiosks to deliver public services in remote regions. A memorandum was also signed following a visit to the IBM Watson West Centre in San Francisco between IBM and ACP PIT to create a laboratory within the start-up hub in Astana to research financial and smart city technologies for urban construction and operation management. Sagintayev also met with Autodesk Vice President David Crane following which a memorandum of cooperation was signed between Autodesk and ACF PIT. Bridgewest Group Chairperson Massih Tayebi also signed a memorandum of understanding with Kazakhtelecom to cooperate on acquiring equipment to develop large-scale internet access networks. A meeting with Managing Partner at Learn Capital Partner Greg Mauro also resulted in a memorandum of cooperation with the Kazakh Ministry of Education and Science’s Information and Analytical Centre to develop a pilot project on charter schools. In California, Sagintayev also met Chairman of the Board of Chevron John Watson to discuss the situation and the forecasts regarding global oil markets, as well as the expansion of cooperation in oil and gas projects in Kazakhstan, as well as the Future Growth Project (FGP) at Tengiz oil field in the west of the country. Sagintayev also visited the Tesla Motors’ office where he discussed innovative technologies in engineering, electric vehicle production and unmanned vehicle management.